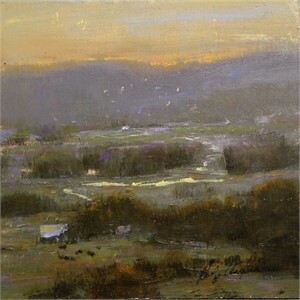 CAROLYN ANNE CROCKER (RUE), American, oil painter specializing in the landscape. A gypsy at heart, Carolyn's imagination is stirred by the distant horizon. 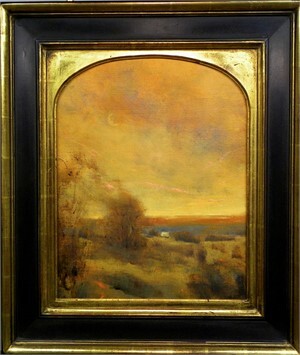 Inspired by the dark romanticism of Inness and Turner, she also is drawn toward scenes that have a sense of mystery. 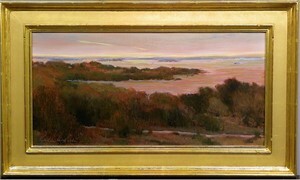 The dawn - pink-tinged and full of promise, a late afternoon haze, and the luminous veil of evening form lasting sentiments of light and color which she translates into memorable oil paintings. 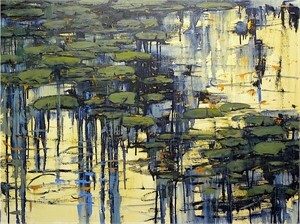 Born in Northridge, CA, her first teacher was her late mother, Impressionist Marilyn Crocker, who painted throughout California. Exposed to a thriving west coast art scene, she filled sketchbooks and developed a love for the early California Impressionists famous for their 1920’s era paintings. She studied at the Los Angeles Art League under Hal Reed followed by independent study with contemporary masters. 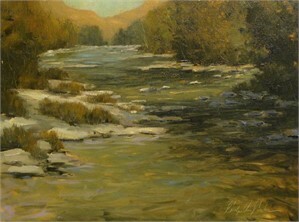 Drawn to the landscape, she then spent several years traveling and painting on location. 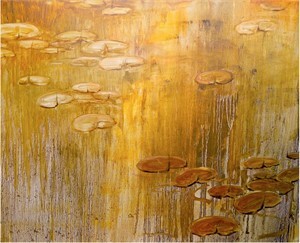 Carolyn has been a full-time artist exhibiting in national level galleries for close to twenty years. Her work is included in private collections throughout the world and is represented by galleries in the District of Columbia, Maryland, North and South Carolina, Tennessee and Texas. She and her husband, product designer James Selby Rue share a home and studios with their Yellow Lab, Sundance, in Banner Elk, NC. 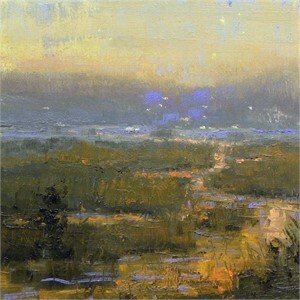 CAROLYN ANNE CROCKER (RUE), American, oil painter specializing in the landscape. A gypsy at heart, Carolyn's imagination is stirred by the distant horizon. 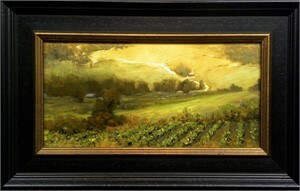 Inspired by the dark romanticism of Inness and Turner, she also is drawn toward scenes that have a sense of mystery. The dawn - pink-tinged and full of promise, a late afternoon haze, and the luminous veil of evening form lasting sentiments of light and color which she translates into memorable oil paintings. 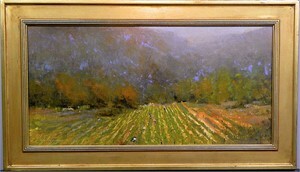 Born in Northridge, CA, her first teacher was her late mother, Impressionist Marilyn Crocker, who painted throughout California. 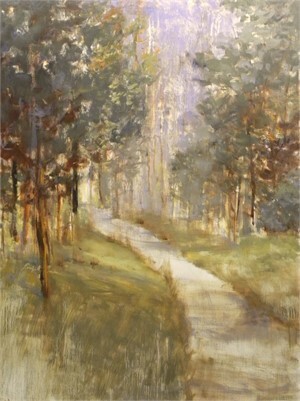 Exposed to a thriving west coast art scene, she filled sketchbooks and developed a love for the early California Impressionists famous for their 1920’s era paintings. She studied at the Los Angeles Art League under Hal Reed followed by independent study with contemporary masters. 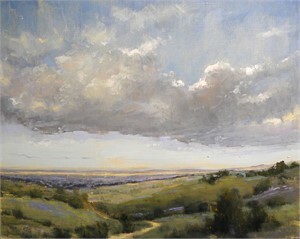 Drawn to the landscape, she then spent several years traveling and painting on location. 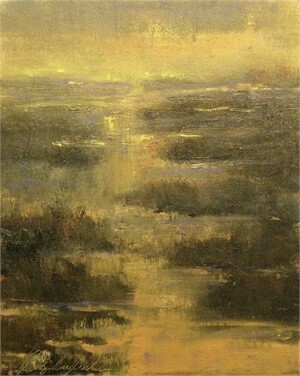 Carolyn has been a full-time artist exhibiting in national level galleries for close to twenty years. Her work is included in private collections throughout the world and is represented by galleries in the District of Columbia, Maryland, North and South Carolina, Tennessee and Texas. She and her husband, product designer James Selby Rue share a home and studios with their Yellow Lab, Sundance, in Banner Elk, NC.